Time to release the year and set an intention for 2018. We welcome the special duo of Däna LeAnne Brown and Mike Heffernan back for a special New Year's Eve soulful vinyasa flow with candlelight and live music. This special class will be meditative, nourishing, challenging and will spark your intentions for 2018. Dana teaches at Divine Yoga in Fall River, is the owner of Art and Asana, and received her 240-hour training from Aura Wellness Center in Massachusetts. She is also a teacher of Thai Yoga Bodywork. 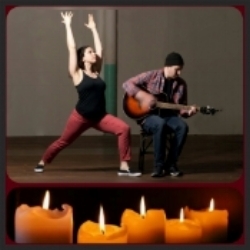 Get a taste of the Candlelight Yoga with Live Music class here by watching this video.